Vitamin D is a fat soluble vitamin which plays a crucial role in the immune system. It is also crucial for the maintenance of the bodys organ systems and the development of strong and healthy bones and teeth. 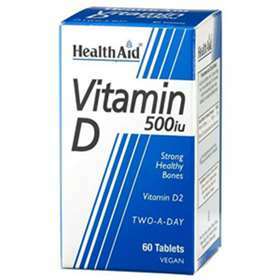 You can control this and make sure it occurs with Health Aid Vitamin D 500iu tablets. Adults and children over 12 years of age - One or two tablets daily. Bulking agent (maltodextrin, microcrystalline cellulose), Vitamin D2 (ergocalciferol), Anti-caking agent (silicon dioxide, veg. stearic acid, veg. magnesium stearate).